Multiple Grade 1 winner Behrens passed away Sunday, Sept. 17, 2014, following a brief illness at Old Friends at Cabin Creek: The Bobby Frankel Division in Greenfield Center, N.Y. The son of Kentucky Derby and Preakness winner Pleasant Colony was 20. "It won't be the same without Behrens," Cabin Creek owner and manager JoAnn Pepper said, fondly remembering the stallion as a "vocal" and kind horse. "I'm glad to have known him." Among the most well-traveled and consistent racehorses of his generation, Behrens won nine of 27 career starts and earned $4,565,500 - the highest bankroll among the Cabin Creek retirees - while racing for owners William Clifton, Jr., and Rudelein Stable and Saratoga-based trainer James Bond. Behrens displayed his ability early in his career, winning the Grade 2 Dwyer Stakes and Grade 2 Pegasus Handicap and finishing second by a nose in the Grade 1 Travers Stakes as a 3-year-old. However, he truly blossomed as an older horse in 1999, winning the Grade 1 Gulfstream Park Handicap, Grade 1 Oaklawn Handicap, Grade 2 Massachusetts Handicap, and Grade 2 Suburban Handicap in succession. His winning streak ended when he finished second by a nose to champion Victory Gallop in a thrilling edition of the Grade 1 Whitney Handicap, one of his nine career Grade 1 placings. Behrens added another victory in the Gulfstream Park Handicap the following season to up his career Grade 1 total to three. Behrens competed in two editions each of the world's richest race, the Group 1 Dubai World Cup, and North America's richest race, the Grade 1 Breeders' Cup Classic. The globe-trotting runner finished second in the 2000 Dubai World Cup. Behrens stood at stud for 13 years, first at Darby Dan Farm near Lexington, Ky., and later at Victory Rose Farm near Vacaville, Calif. The stallion arrived at Old Friends at Cabin Creek to live out his days as a pensioner in the summer of 2013. 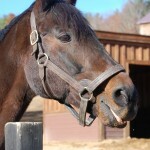 His paddock was beside that of former stable mate Will's Way, winner of the 1996 Travers and 1997 Whitney. Behrens is buried at Old Friends at Cabin Creek.